Dark, milk and white chocolate chunk cookie dough. Wheat Flour (Wheat Flour, Calcium Carbonate, Iron, Niacin, Thiamin), Margarine, Butter (Milk), Sugar, Dark Chocolate Chunks (7%), Brown Sugar, Water, Milk Chocolate Chunks (5%), White Chocolate Chunks (4%), Cocoa Powder, Raising Agents (Disodium Diphosphate, Sodium Carbonate). Margarine contains: Palm Oil, Water, Rapeseed Oil, Salt, Emulsifier (Mono- and Di-Glycerides of Fatty Acids). Dark Chocolate Chunks contain: Sugar, Cocoa Mass, Cocoa Butter, Emulsifier (Soya Lecithins), Flavouring. Milk Chocolate Chunks contain: Sugar, Dried Whole Milk, Cocoa Butter, Cocoa Mass, Emulsifier (Soya Lecithins), Flavouring. White Chocolate Chunks contain: Sugar, Dried Whole Milk, Cocoa Butter, Emulsifier (Soya Lecithins), Flavouring. 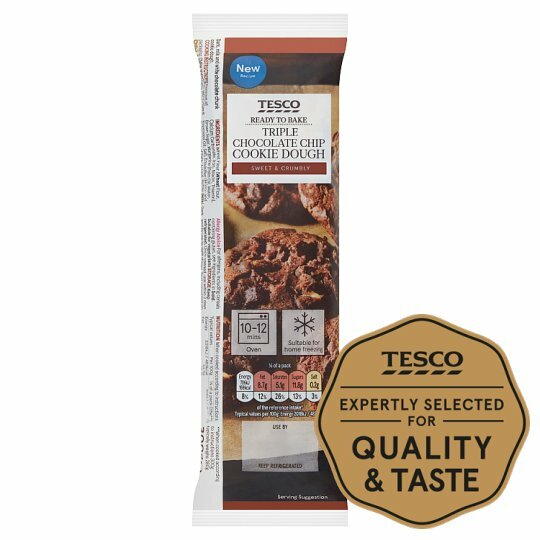 Keep refrigerated., Once opened, use within 2 days and by use by date shown., Best consumed on day of baking, once baked store in an airtight container. Instructions: 200°C/Fan 180°C/Gas 6 10-12 mins Remove from refrigerator 10 minutes before use. Cut into 8 equal pieces and place onto a lined baking tray, approx. 5cm apart. Using the palm of your hand press each cube to slightly flatten. Place in the centre of a pre-heated oven for 10-12 minutes or until golden brown. Defrost thoroughly for a minimum of 12 hours in the refrigerator or for 2 hours at room temperature. Follow the preparation guidelines adjacent.